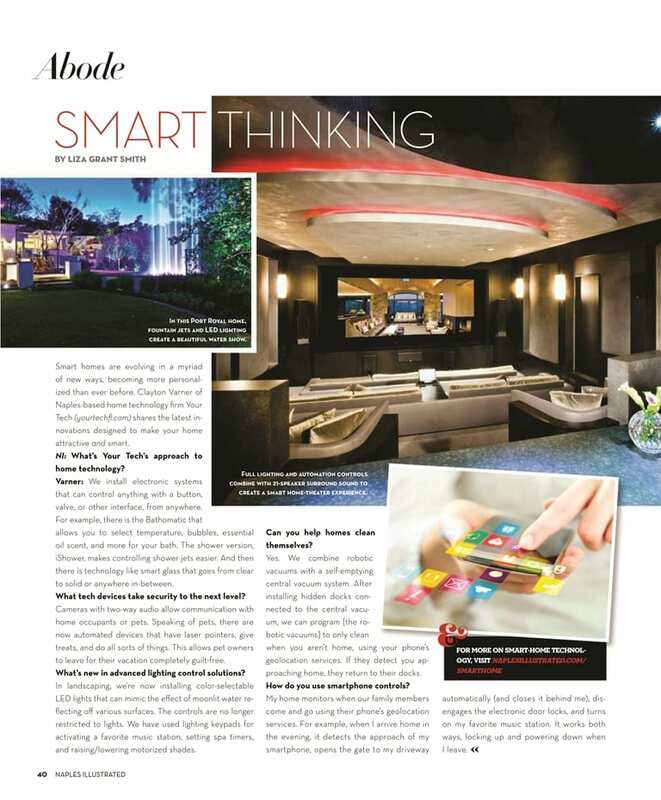 Smart homes are evolving in a myriad of new ways, becoming more personalized than ever before. Clayton Varner of Naples-based home technology firm Your Tech (yourtechfl.com) shares the latest innovations designed to make your home attractive and smart. Naples Illustrated: What’s Your Tech’s approach to home technology? Varner: We install electronic systems that can control anything with a button, valve or other interface, from anywhere. For example, there is the Bathomatic that allows you to select temperature, bubbles, essential oil scent, and more for your bath. The shower version, iShower, makes controlling shower jets easier. And then there is technology like smart glass that goes from clear to solid or anywhere in-between. What tech devices take security to the next level? Cameras with two-way audio allow communication with home occupants or pets. Speaking of pets, there are now automated devices that have laser pointers, give treats, and do ll sorts of things. This allows pet owner to leave for their vacation completely guilt-free. What’s new in advanced lighting control solutions? In landscaping, we’re now installing color-selectable LED lights that can mimic the effect of moonlit water reflecting of various surfaces. The control are no longer restricted to lights. We have used lighting keypds for activating a favorite music station, setting spa timers, and raising / lowering motorized shades. Can you help homes clean themselves? Yes. We combine robotic vacuums with a self-emptying central vacuum system. After installing hidden docks connected to the central vacuum, we can program [the robotic vacuums] to only clean when you aren’t home, using your phone’s geolocation services. If they detect you approaching home, they return to their docks. How do you use smartphone controls? My home monitors when our family members come and go using their phone’s geolocation services. For example, when i arrive home in the evening, it detects the approach of my smartphone, opens the gate to my driveway automatically (and closes it behind me). disengages the electronic door locks, and turns on my favorite music station. It works both ways, locking up and powering down when I leave.